Malaria Vaccine Cuts Infection Risk By Half, Study Says : Shots - Health News Several thousand young African children who got three doses of the experimental vaccine had about 55 percent less risk of getting malaria over a year than those who got a control vaccine against rabies or meningitis. After decades of disappointment, researchers think they're finally on track to unleash the first practical vaccine against malaria, one of mankind's ancient scourges. 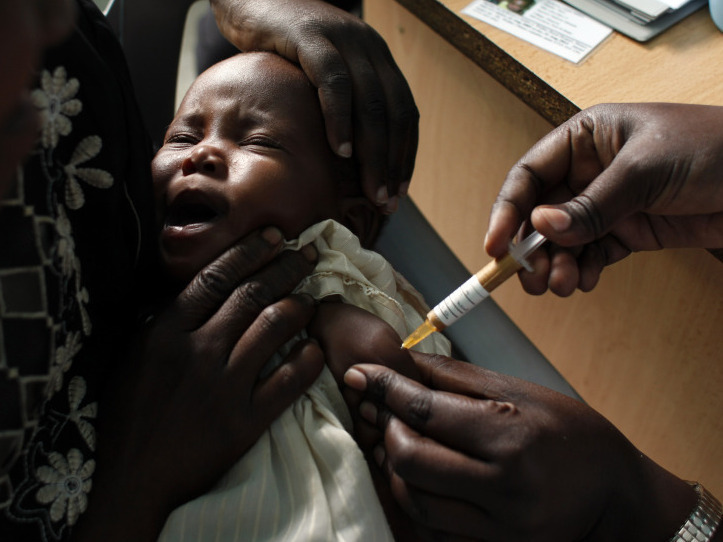 In the world's first large field trial of an experimental malaria vaccine, several thousand young children who got three doses had about 55 percent less risk of getting the disease over a year than those who got a control vaccine against rabies or meningitis. Dr. Christian Louqc, who's leading the final-phase clinical trial at 11 sites across Africa, tells Shots that among several thousand children who got "control" vaccines, there were 1,500 cases of malaria — more than one episode per child in the following year. But for every 1,000 children who got the experimental malaria vaccine, there were only 750 cases of malaria. Considering only life-threatening malaria, there were 20 cases among every 1,000 children who got the study vaccine, compared to 40 cases per 1,000 children who got vaccines for other diseases. Researchers say adverse reactions occurred equally among children who got the malaria vaccine and those who got control vaccines. Some children who got the malaria vaccine had fevers and seizures, but all recovered. There was also a higher incidence of meningitis among those vaccinated against malaria, but the researchers don't think the cases were caused by the vaccine. Of course, 50 percent effectiveness is far less than the 90 percent-plus protection offered by established vaccines against polio, measles, whooping cough, tetanus and other infections. When asked if the Bill and Melinda Gates Foundation, which funded much of the malaria vaccine development, considered the 50 percent effectiveness level satisfactory, the foundation's Dr. Regina Rabinovich said, "I would prefer to see 100 percent efficacy, absolutely." She said more data will be needed to determine if the results are strong enough to warrant deploying the vaccine widely. Still, as a first step, malaria researchers say the new vaccine could prevent malaria in tens of millions of children and save hundreds of thousands of lives per year. Malaria relies on mosquito bites of infected humans to spread. And one infected person in a community can lead to 100 other cases. "We are very, very happy," Loucq told Shots. "It's the first vaccine developed against a parasite. Developing a vaccine against a parasite is not an easy task." The decade-long development of this vaccine, termed RTS,S for its different components, has so far consumed more than a half-billion dollars – about $300 million from its sponsor, GlaxoSmithKline, and $200 million from the Gates Foundation, through grants to a nonprofit group called the PATH Malaria Vaccine Initiative. Loucq is head of the MVI. Dr. Patricia Njuguna, a Kenyan pediatrician in charge of one of study sites, told Shots that when the results became clear last month, "the response was quite a lot of relief because it actually confirmed that what we'd been seeing previously was not a fluke result, it was really the real thing." "We were absolutely thrilled," says Dr. Ripley Ballou of GlaxoSmithKline. "It's what every vaccine developer dreams of — being able to work on a project like this." Since malaria kills nearly 800,000 people a year — most of them children under 5 in sub-Saharan Africa — the impact of a vaccine that's 50 percent protective could be large, if the economics and logistics of deploying it can be worked out. "When you multiply this across all the small villages, the countries, the communities now living under this threat, it's a huge issue," Ballou told Shots. The study, released at a malaria conference in Seattle and published online by the New England Journal of Medicine, involved 6,000 children 5 to 17 months old. They were scattered among seven sub-Saharan African countries — a region where malaria sickens tens of millions every year. The vaccine news comes at a time when optimism about controlling malaria is rising. The World Health Organization's Roll Back Malaria program reported yesterday at the Seattle meeting that up to a third of the 108 countries where malaria is endemic are close to being able to eradicate malaria. This has been achieved through the use of modern diagnostic tests and effective treatment, deployment of insecticide-impregnated bed nets to reduce bites from infected mosquitoes, and insecticide spraying of homes. Deaths from malaria worldwide have declined 20 percent over the past five years or so. By validating earlier, smaller studies, the new trial is encouraging public health experts to think again about eradicating malaria. An earlier campaign to stamp out the disease in the 1950s made significant inroads. But it foundered as the malaria parasite developed resistance to the mainstay treatment, a drug called chloroquine, and Anopheles mosquitoes became resistant to the insecticide DDT. A year from now researchers expect to release results on about 9,000 younger infants — those six to 12 weeks old. They represent the primary target population to get a malaria vaccine along with other immunizations. Advocates say this week's results put the malaria vaccine on track to win approval in 2015 from the European Medicines Agency and from World Health Organization. It's not yet clear how much the vaccine will cost. "We have no intention of making a profit here," GlaxoSmithKline chief executive Andrew Witty said at a teleconference Tuesday. "We are committed to achieving the lowest price possible." GSK has committed to charging no more than the cost of producing the vaccine plus a 5 percent margin that will be devoted to malaria treatment and other infectious disease research. Witte says GSK will press its suppliers "to commit to reducing their profit margins or eliminating profit altogether," and adds that the company may locate malaria vaccine plants in Africa or India "as a further means to reduce the cost." But GSK officials wouldn't comment on the possible price range. UNICEF buys many vaccines for pennies a dose. For instance, polio vaccine costs the agency about 15 cents a dose, hepatitis B costs 18 to 40 cents a dose, and meningitis costs 85 cents to $1.04.